The model’s short wave cloud forcing compared to observations. A-PRIME (Accelerated Priority Metrics) version 1.2 was just released. A-PRIME is a collection of scripts designed to provide E3SM model developers and analysts with a variety of metrics regarding E3SM simulation output, which is needed to determine if the model is producing the desired results. Its mission is to enable E3SM developers to quickly assess the major model component attributes and identify critical biases early. It is designed to be executed on machines where the model is running, to prevent data transfer delays. This software enables a quick determination of simulation quality and is designed to flag serious simulation issues that will prevent wasted computer and develop time during long simulation campaigns. 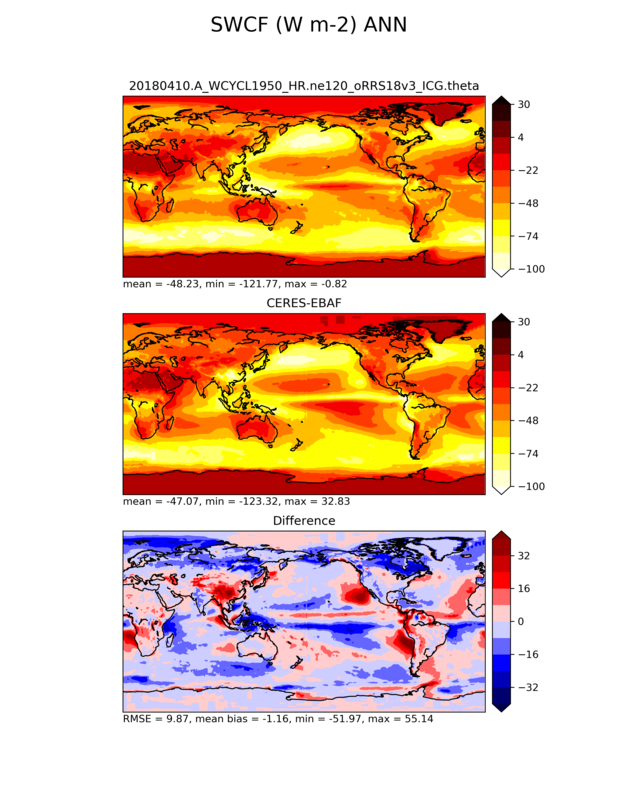 A suite of plots that show a wide variety of aspects to a model simulation, for example, precipitation, cloud forcing, temperature, ENSO statistics, sea ice concentration etc., are created from the simulation output. As one example, this figure shows the model’s short wave cloud forcing compared to observations for a short test high resolution run to enable comparison and evaluation.